To build the backend for our notes app, it makes sense that we first start by thinking about how the data is going to be stored. We are going to use DynamoDB to do this. 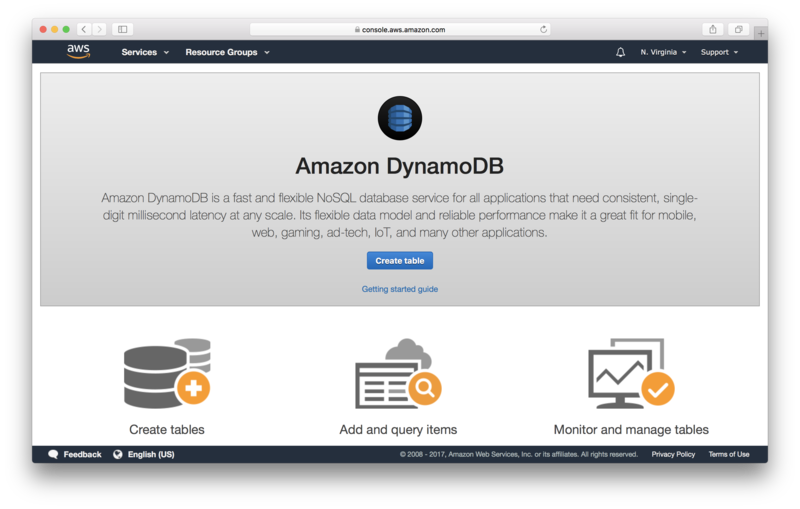 Amazon DynamoDB is a fully managed NoSQL database that provides fast and predictable performance with seamless scalability. 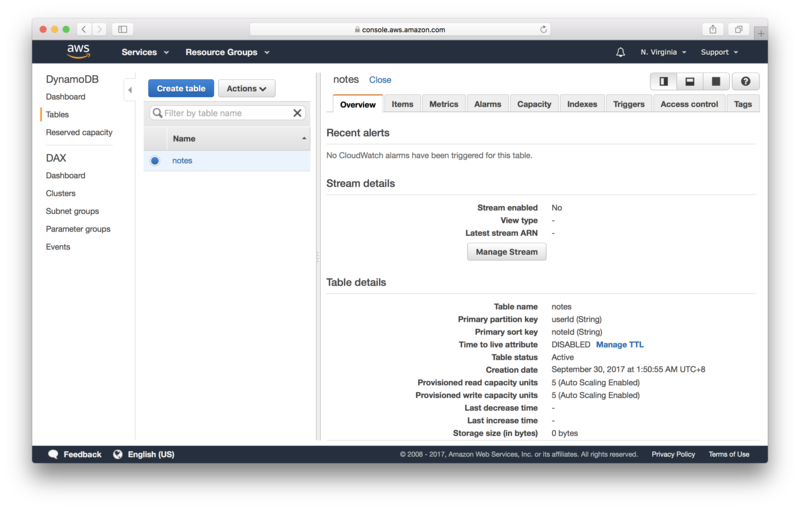 Similar to other databases, DynamoDB stores data in tables. Each table contains multiple items, and each item is composed of one or more attributes. We are going to cover some basics in the following chapters. 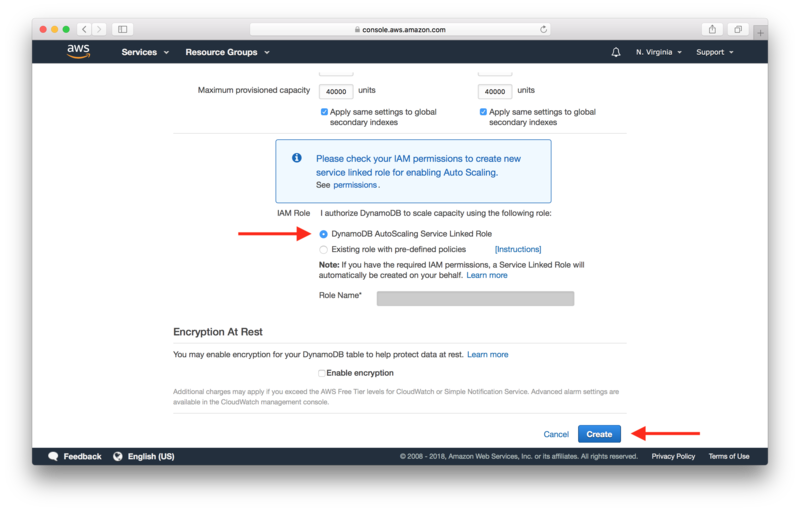 But to get a better feel for it, here is a great guide on DynamoDB. 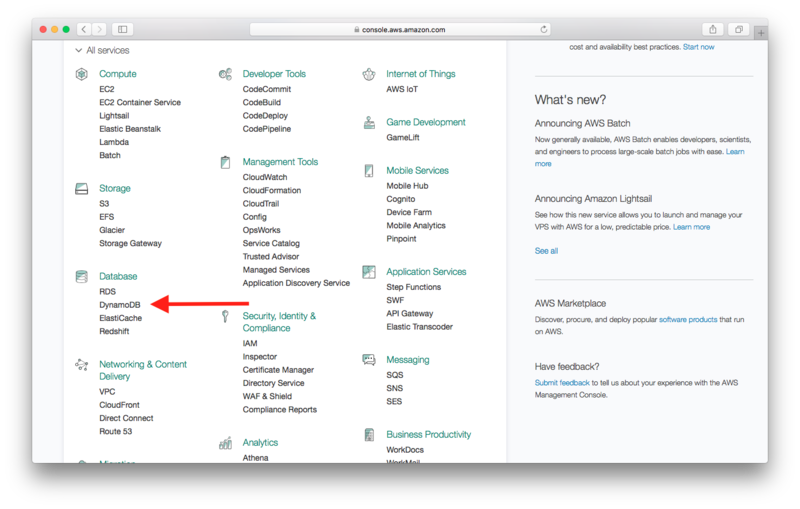 First, log in to your AWS Console and select DynamoDB from the list of services. Enter the Table name and Primary key info as shown below. Just make sure that userId and noteId are in camel case. We are going to use the composite primary key which gives us additional flexibility when querying the data. For example, if you provide only the value for userId, DynamoDB would retrieve all of the notes by that user. Or you could provide a value for userId and a value for noteId, to retrieve a particular note. If you see the following message, deselect Use default settings. Scroll to the bottom, ensure that DynamoDB AutoScaling Service Linked Role is selected, and select Create. Otherwise, simply ensure that Use default settings is checked, then select Create. Note that the default setting provisions 5 reads and 5 writes. When you create a table, you specify how much provisioned throughput capacity you want to reserve for reads and writes. DynamoDB will reserve the necessary resources to meet your throughput needs while ensuring consistent, low-latency performance. One read capacity unit can read up to 8 KB per second and one write capacity unit can write up to 1 KB per second. You can change your provisioned throughput settings, increasing or decreasing capacity as needed. The notes table has now been created. If you find yourself stuck with the Table is being created message; refresh the page manually. It is also a good idea to set up backups for your DynamoDB table, especially if you are planning to use it in production. We cover this in an extra-credit chapter, Backups in DynamoDB. Next we’ll set up an S3 bucket to handle file uploads.